This K idioms list is complete with definitions and examples. Learning idioms can be hard but if you "KEEP at it," "before you KNOW it" you'll learn lots of them! Each idiom on this list has a main word that begins with the letter "K." If you're interested, I've also covered the other letters of the alphabet: click here to go to the main idioms page. Before we get started, remember that an idiom is a group of words whose meaning is different from the individual words if you looked them up separately in the dictionary. 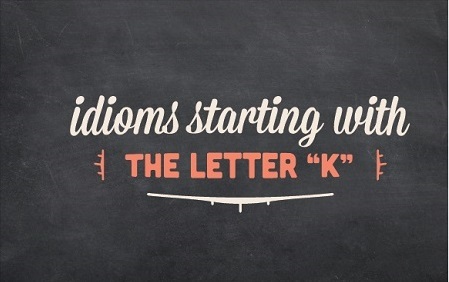 Now, let's take a look at the most popular K idioms. keep abreast of something: to get the most recent information about something. When you decide what countries you are going to visit, please let me know because I'd like to keep abreast of your travels. For my work it's really important for me to keep abreast of new things happening in Africa. keep after someone: to repeatedly remind someone to do something. If your boss doesn't approve your request for a raise, keep after him until you get it because you deserve it. It's very frustrating to have to keep after you every evening until your homework is done so if things do not improve I'm going to disconnect the internet. keep at something: to continue to do something. If you keep at practicing the guitar every evening, you're going to play very well at the end of the year. Stop bothering me! If you keep at it I'm going to be very angry. keep someone down: to discourage someone or prevent them from doing something. No one can keep you down if you are determined to do something. Sadly, it's common that when people start to lose weight, some of their closest friends and family will try to keep them down by giving them sweets and fatty foods..
keep something down (keep down something): 1) to eat or drink something and not vomit afterwards. 2) to stop something from increasing. When I was very sick it was difficult for me to keep any food down and I lost a lot of weight. The first three months of my pregnancy I couldn’t keep anything down and threw up all day long. The government is trying to keep inflation down but it’s not working. Excuse me, if you cannot keep your voices down you’ll have to leave the library. keep someone posted: to update or tell someone whatever new is happening about a situation. Please keep your mother and I posted during your trip and send us text messages each time you travel to a new city. I will keep everyone posted about the event through Twitter and Facebook. keep quiet about something: to not talk about something. Yes, I knew they were getting divorced months ago but they asked me to keep quiet about it. Since this is very personal, promise that you will keep quiet about it. keep to something: to continue to do something. How can you keep to a low calorie diet during the holidays? I always wait until after New Year’s to diet. I hope you will keep to your studies this evening after we leave. keep to oneself: to stay by oneself and avoid other people. At conferences I usually keep to myself because I’m very shy about meeting new people. I’m not sure why but our neighbors keep to themselves and don’t socialize with the other people on the street. keep something to oneself: to not tell someone about something. If that’s your opinion I wish you would keep it to yourself next time instead of ruining the party. I’m going to keep this information to myself until the company has made an announcement. keep up something (keep something up): to continue to do something. Keep up that negative attitude and no one’s going to want to be around you. I hope you keep your hopes up about the future because I’m sure things will change soon. If everyone keeps up the pace, we’re going to finish the project ahead of the deadline. for keeps: to have something forever. When we got married, I gave my heart to my wife for keeps. keyed up: excited or nervous about something. My kids have been keyed up for Halloween ever since we bought their costumes. I’m really keyed up about my presentation this afternoon. You’re really keyed up, why don’t you try some deep breathing? get a kick out of something: to really enjoy something. I really get a kick out of watching my two-year-old nephew — he’s so naughty. You’re really getting a kick out of that new iPad, aren’t you? If you can kick in even 30% of the cost, I'll pay the rest. It took weeks for the antidepressant to finally kick in but I started to feel much better when it did. Ugh! My allergies have kicked in and I'm so congested that I can hardly breathe. kick oneself: to be angry and/or annoyed with oneself. I could kick myself for not investing more into my retirement account when I was younger. If you don’t stay home and work on your paper tonight you’re going to kick yourself tomorrow. kick something around (kick around something): to discuss something. We’re going to have an informal meeting this afternoon and just kick around ideas for the holiday party. We didn’t make any decisions yet; we need to kick a few more ideas around first. kick back: to not do much of anything. When I go on vacation I prefer going around to see things but my husband only wants to kick back on the beach and relax. Thanks for watching the safety demonstration. Now kick back, relax and enjoy the flight. kick off something: to start something. They kicked off the meeting with a fun icebreaking activity so everyone could get to know each other. We’re going to kick off the festival with a 10K race to benefit charity. kid around: to joke with someone. I really like my boss because he’s not that serious and likes to kid around with the rest of us. Put your toys away and go to bed! I'm not kidding around! the new kid on the block: someone who’s recently arrived. I can’t wait until the next intern starts working on Monday — I’m tired of being the new kid on the block. Did you see the new kid on the block? He'sin my accounting class and he's really cute. kill time: to do something while waiting for something/someone. When I was waiting for my number to be called I killed time on Instagram and Facebook. When my kids’ bus is late arriving, I do push-ups and jumping jacks to kill time. kill someone with kindness: to be so nice to someone that they allow you to do or have something. Whenever I check in at the airport, I kill the customer service representatives with kindness and often I get upgrades on my flights. If you want to get ahead at this company, you have to kill the receptionist with kindness because she controls a lot of things around here. make a killing: to earn a lot of money very quickly. My brother thought he could make a killing selling CDs on the Internet but MP3 digital downloads became popular and no one wanted CDs anymore. You could make a killing selling your artwork at the Ann Arbor Art fair. out of kilter: not working properly. Our coffee machine was out of kilter this morning so I had to have tea instead. Is the photocopier still out of kilter? I need to make copies of the report. in kind: in the same manner, with the same thing. Even when the kids at school are mean to you shouldn’t respond in kind. Whatever gift I buy for my mother-in-law, she always responds in kind. one-of-a-kind: the only item of its type (there isn’t another item like it). My engagement ring was handcrafted so it’s one-of-a-kind. The imperfections in these leather purses is what makes them one-of-a-kind. not take kindly to something/someone: to not be pleased by something/someone. I don’t take kindly to young people who speak to me by my first name at the grocery store. He doesn’t take kindly to anyone who criticizes him even when their comments can help him. kiss and make up: to be friendly again after having an argument for disagreement. The best part of an argument is kissing and making up. I wish you would stop arguing and kiss and make up — life is too short to be mad at each other for stupid little things. kiss and tell: to talk about someone’s private information in public. She’s not my friend anymore — I didn’t think she was the type that would kiss and tell but that’s exactly what she did. I hate it when celebrities kiss and tell after they get divorced. kiss something goodbye (kiss goodbye something): to end or lose something. After your baby is born, you can just kiss a good night's sleep goodbye. I can’t wait till we can kiss this winter snow goodbye; I’m ready for spring weather to come. When we broke up, unfortunately I had to kiss goodbye a lot of our common friends. bring one/something to its knees: to defeat or stop someone/something. A heart attack will bring a workaholic to their knees. You better stop drinking and driving or an accident or arrest will bring you to your knees! twist the knife: to make a situation worse by saying or doing something. It was one thing to fire me, but to do it in front of everyone really twisted the knife. Please don’t say anything else — you can see she feels terrible about what she did so there’s no need to twist the knife. under the knife: to have an operation or medical surgery. In Hollywood, it’s completely normal for women to go under the knife for cosmetic surgery after the age of 20. I’m so scared because my husband is going under the knife this afternoon and I don’t want anything to happen to him. Knock it off! You’re making so much noise I can’t concentrate. If you don’t knock it off I’m going to leave — you’re teasing was fun for the first hour but now I’m tired. knock someone out (knock out someone): 1) to hit someone so hard they become unconscious; 2) to make someone go to sleep. Did you see the boxing match last night? Pacman knocked out Ricky Hatton in the second round. Yesterday, at 7 PM I took some cold medicine and it knocked me out until 7 AM the next morning. knock someone up (knock up someone) (slang): to get someone pregnant. My brother knocked up his wife again — they already have six kids. I always use protection because I’m terrified of knocking my girlfriend up. tie the knot: to get married. We got engaged last year but we're not going to tie the knot until we graduate from school. My best friend tied the knot yesterday and today she’s going to Bali for her honeymoon. before you know it: in a very short period of time. Before you know it summer will be over and it will be time to go back to school. Last night I decided to get on the Internet to check email really quickly and before I knew it, three hours passed by. in the know: knowing more about something than other people. I recommend you contact my travel agent — she’s always in the know about last minute specials. My hair stylist is in the know because everybody tells him their personal business. know better (than to do something) / not know any better: to be smart enough to do the right thing or behave in an appropriate way. I can’t believe that you took all of these office supplies from your office — you should know better! Don’t yell at him. He’s only five years old and he doesn’t know any better. You know better than to invite your friends over when we're not at the house. know where one stands: to have a clear understanding of a situation or what someone thinks. I hate working for my new boss because I never know where I stand with him. This program is amazing because it tracks all the calories you consume each day so you know exactly where you stand. not know what hit you: to be shocked and confused about something surprising that happens to you. When my husband left me two weeks after we got married I didn’t know what hit me. My mother came into my room and grabbed my phone so quickly that I didn’t know what hit me. not know where to turn: to not know what to do in a situation. After I lost my job and my unemployment benefits ended, I didn’t know where to turn. If you ever get lonely and don’t know where to turn, just remember you can always call me. not know whether to laugh or cry: to be very upset and frustrated about something. When the doctor’s office told me the first available appointment was five months later, I didn’t know whether to laugh or cry. When I dropped my iPhone in the toilet, I didn’t know whether to laugh or cry. knuckle down: to work very hard. It’s final exam week so I’ve got to knuckle down and finally start studying. I didn’t do anything all morning but I was able to knuckle down and finish my report this afternoon. You can also find many idiom definitions in one of the online learner's dictionaries. 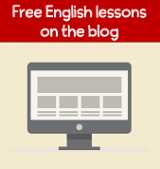 For English learners it's most important to focus on understanding and remembering idioms. You don't have to worry about using them in speech, especially at the beginning. It's really easy to make mistakes. It's still a good idea to practice writing your own sentences because this will help clarify your understanding of idioms and also help you remember them better. So this is an opportunity for you to practice and get feedback, because I will revise any mistakes in your practice sentences. Simply choose one or several K idioms from the list and create your own sentences in the comments box below.